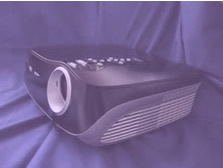 Immersive Inc, manufacturers of the stunning Virtuoso DLP Projector, used CES 2004 in Las Vegas as a platform to show for the first time in public their new Eclipse (patent pending) technology, designed to increase useable contrast in fixed pixel devices. Not yet implemented in any devices Eclipse is already the HOT topic of conversation on the Net and beyond. We flew to USA to view this historic demo and were very impressed by what we saw and we look forward to a working implementation sometime much later in the year. That wasn't all they had up their sleeves though. Expect to see the Immersive product pages updated over the next 14 days with specs and pricing on a new SD/HD scaler called Simmetry and a stand alone digital audio delay unit. Simmetry is based on the Faroudja de-interlacing chipset and is modular to allow input expansion and or digital audio delay board. More news on both soon. To register interest in any products just email info@convergent-av.co.uk or call 01555 890120.